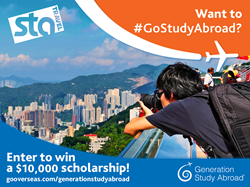 Want to #GoStudyAbroad? Enter to win a $10,000 scholarship! Students who enter the contest can win a grand prize $10,000 scholarship to study anywhere in the world and a free round trip ticket, sponsored by IIE and STA Travel, among other travel prizes. Today STA Travel, in partnership with the Institute of International Education (IIE), Go Overseas, and three leading study abroad and travel organizations, launched a nationwide campaign asking everyone who has ever studied abroad to encourage college students to study abroad by the time they graduate. Anyone can nominate students to #GoStudyAbroad through the GoOverseas Generation Study Abroad Alumni page or by tagging them on social media using the hashtag #GoStudyAbroad. The #GoStudyAbroad campaign is part of IIE’s Generation Study Abroad, a five-year initiative to double the number of students who study abroad by the end of the decade. Students who enter the contest through GoOverseas can win a grand prize $10,000 scholarship to study anywhere in the world and a free roundtrip ticket, sponsored by IIE and STA Travel, among other travel prizes. Less than 10% of U.S. students study abroad by the time they graduate from college. With 1 in 5 jobs linked to international trade and employers looking for global talent, more U.S. students must study abroad to broaden their perspectives, understand and tolerate different ways of life and succeed in today's global workforce. College students who studied abroad are hired more quickly after graduation with higher starting salaries, more likely to land jobs in their fields, and less likely to be unemployed five years after graduation, according to several post-study abroad surveys and reports. IIE is calling on anyone who studied abroad to pay it forward by nominating college students to consider and/ or commit to studying abroad by the time they graduate. The goal is to mobilize at least 10,000 study abroad alumni to nominate students to #GoStudyAbroad. IIE and campaign partners AIFS Study Abroad, CET Academic Programs, IFSA-Butler, and STA Travel are targeting study abroad alumni, but anyone may nominate students to #GoStudyAbroad. Alumni who nominate students to study abroad are eligible to win a grand prize round trip international flight, sponsored by IFSA-Butler, among other travel prizes. The more students someone nominates, the better the chances to win. "Our mission at Go Overseas is to inspire as many students as possible to engage in study abroad programs with meaningful cultural exchange. We passionately live and breathe this mission on a daily basis,” said Mitch Gordon, Go Overseas’ CEO and Co-Founder. “In partnership with IIE, our goal is to connect as many of our 30,000 daily and 900,000 monthly visitors as possible with study abroad programs that will change their lives, and the lives of those with whom they interact." The contest runs until March 31, 2016. STA Travel is the world’s leading student and youth travel agency, successfully enabling young adults to explore the world since 1979 by creating experiences filled with adventure, discovery and personal growth. STA Travel offers a unique range of products with exclusive discounts on airfare, accommodations, tours, rail passes and more. STA Travel has more than 2,000 people in over 200 stores in 11 countries, and sends more than 2.5 million passengers away each year on life-changing adventures. The Institute of International Education (IIE) is a world leader in the international exchange of people and ideas. IIE designs and implements programs of study and training for students, educators, young professionals and trainees from all sectors with funding from government agencies, foundations and corporations. IIE also conducts policy research and program evaluations, and provides advising and counseling on international education and opportunities abroad. An independent, not-for-profit organization founded in 1919, IIE has a network of 19 offices and affiliates worldwide and over 1,400 member institutions. Go Overseas is the leading website for programs abroad. With over 30,000 daily and 900,000 monthly visitors, more people use Go Overseas to find life changing, meaningful travel programs than any website in the world. Go Overseas incorporates reviews, interviews, articles and other community features to help people make informed and educated decisions when choosing travel programs. Most importantly, Go Overseas inspires people around the world to travel differently and to travel with a purpose.